Earlier this week we were informed that Watanabe gym trainer Tomoaki Takahashi had been selected for the 2015 Eddie Townsend Award, as the best trainer in Japan. The award, named after the brilliant Eddie Twownsned, is an annual award in Japan and has been won by numerous top trainers, including Shingo Inoue who won it last year and Hiroaki Nakade who won it in 2013. Takahashi has won the award for his work over the last 12 months. That work has included being in the corner for fighters like Kohei Kono, Rikiya Fukuhara and Ryuichi Funai. Whilst neither Fukuhara and Funai managed to record a major win this year it's fair to say that guiding Kono to victory against Koki Kameda in the US a few weeks ago was a major achievement and was at least partly responsible for the award. This is the second time Takahashi has won the award, with him also being one of the shared winners in 2010 which was won by the collective "Team Uchiyama", who were behind the rise of Takashi Uchiyama. Not only was this Takahashi's second win but also the second time the award has gone to a trainer from the Watanabe gym. 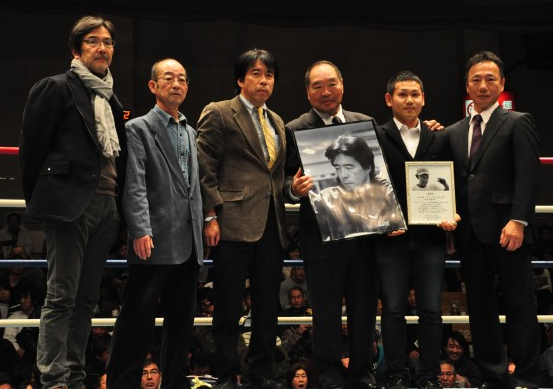 Earlier today at the Korakuen Hall fans saw trainer Shingo Inoue being honoured for his achievements in 2014 as he was officially given the Eddie Townsend award. The award, named after the great Eddie Townsend who helped create several Japanese champions, is given to the best trainer in Japan over the previous year and it's fair to say no one would be arguing with Mr Inoue being a deserving winner. Mr Inoue is the trainer and father of two current stars of Japanese boxing. The oldest of those fighters is young prodigy and current WBO Super Flyweight world champion Naoya Inoue (8-0, 6) who was probably the 2014 fighter of the year whilst the younger of the two fighters trained by Mr Inoue is the world ranked Takuma Inoue (4-0, 1). Between those two men they went 6-0 (4) for the year, with a world title record of 3-0 (3) an incredible achievement by both the trainer and the fighters.